RoboCop RoboCopy is a GUI skin and script generator for Robocopy.exe (Win NT Resource Kit). The GUI includes some basic coping options with the addition of a progress bar. The current version (3.0) includes entry for network URL source or destination, a speed monitor displaying your current file copy speed in MB/s, an estimated time for the completion, a file copy list displaying the files copied to the destination with right click options to open file and/or location and some other general improvements with the inclusion of an 'undock' feature to unlock the current running scripts from RoboCop RoboCopy application skin frame and a 'rebock' feature to redock. RoboCop Robocopy was developed using Visual Studio under the .NET framework 3.5 and is compatible with Windows XP, Visa, 7 and 8 on both 32bit and 64bit systems. To download a copy click on the download button below. For more information click here to go to the Robocop Robocopy software page. Encrypting/Decrypting Text - This option allows for any text you enter into the text pad to be encrypted. Encrypting/Decrypting files or folders - This allows for individual files or folders to be encrypted. Encrypt Box - A folder set aside for permanent encryption with easy drag and drop secure encryption. For info, screen shots, demo video's, and more go to the Simple File Encryptor software page. IP change has been developed as a batch script (.bat) designed for the XP command interpreter however is forwards compatible with any current windows OS (Win7 & 8 may need to 'run as admin'). Easy IPChange is the best free IP Changing script out there so check it out and add it to you admin toolbox today! If you don't like it - tell me about it...and if you do - Win Win! Check out the Easy IPChange page for more screen shots, a video demo and the batch code. 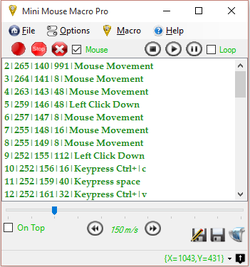 Mini Mouse Macro is a light weight mouse macro that records mouse movements with left and right clicks and also keystrokes with the ability to replay once or replay on a loop and a scripting feature for task scheduling. 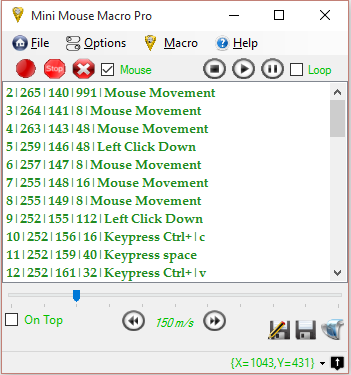 Mini Mouse Macro is constantly evolving and improving so please update often to get the latest improvements and features. Give Mini Mouse Macro a try and please send me back some feedback on what to improve or what to add further releases. For more info on Mini Mouse Macro check out the main page here. Please pass on your comments and suggestions here or on the Sourceforge download page.